Fibre optic cable is used in the telecommunications industry for ultra-fast transfer of information for telephones and computer networks. 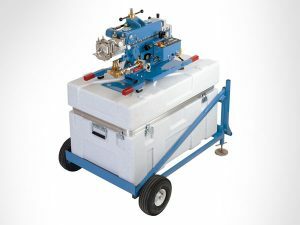 The fibre optic cable handling equipment manufactured by Redmond Gary Australia is used for the installation of fibre optic cable through ducts, in open trenches and on telegraph poles. The type of fibre optic cables we supply installation for is for long run cables running from city to city, suburb to suburb and in the streets. It is not usually used inside buildings. Fibre optic cable has specific requirements such as minimum bend radius and maximum pull specifications. Fibre optic cable is normally made out of glass fibres and can be easily damaged if the bend radius is too small or the pulling tension is too great. Damage to fibre optic cables normally means that additional repeater stations are required. This is a high cost item. Also, the length of fibre optic cable installed should be maximised because providing joints in fibre optic cables is time consuming and expensive. For this reason, fibre optic cable handling equipment must be specially designed to accommodate the requirements of the fibre optic cable. Redmond Gary Australia manufactures a number of products, specifically to handle fibre optic cable. Four types of capstan winches can be provided. It is normal for winches when doing work for Telecom, that they be derated from 5kN to 2kN, maximum line pull. 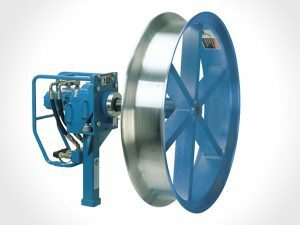 Fibre optic winches are provided with a large capstan wheel which is approximately 1300mm in diameter. The diameter is critical so as not to damage the fibre optic cable when it is wrapped around the wheel. 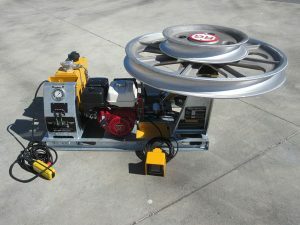 All fibre optic winches are provided as standard with the large wheel. In the telecommunications industry they don’t only install fibre optic cable but also copper cable. When installing copper cable, the line tension can be much greater and the bend radius of the cable can be much smaller. 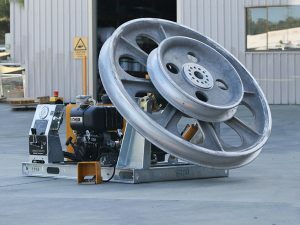 As an optional accessory, all fibre optic winches can be provided a smaller wheel which is mounted on top of the large wheel. This wheel doubles the line pull and halves the speed. For a 5kN fibre optic winch, this wheel has a full rating of 10kN and for a 2kN fibre optic winch the wheel increases it to 4kN. For 5kN fibre optic winches we can provide a very small wheel which increases the pulling capacity up to 20kN. All fibre optic winches are intended to be operated by one person. They are all provided with foot operated control to start and stop the rotation of the wheel. Depending of the type of model selected additional controls are available, such as, pendant control to control wheel direction, speed, and emergency stop. All winches are provided with calibrated pressure gauge which indicates the line pull. The line pull can be preset to a specific requirement to meet the specification of the cable being hauled. In addition, some winches are provided with speed and distance display in a digital format. At special request, electronic data loggers can be provided. Redmond Gary Australia has designed specialised self-loading cable drum trailers for fibre optic cable. These trailers include 1t, 2.5t, and 3.2t capacity. The trailers accommodate large drums in comparison with their weight capacity. Fibre optic cable is typically lighter than copper cables and is installed on larger drums to reduce the damage as a result of small bending radius. In addition, fibre optic cable is normally pulled off the drum either by a winch or by hand. 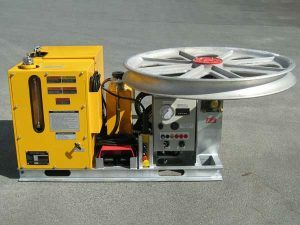 Trailers are specifically designed so the cable drum rotates much easier on the cable. 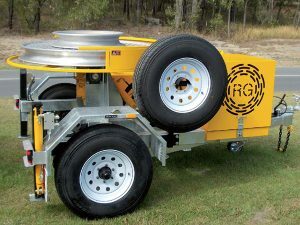 As an alternative to using self-loading cable drum trailers Redmond Gary also offers a comprehensive range of fixed cable drum trailers and drum stands. This equipment can be tailored to customer’s specific requirements. Redmond Gary Australia represents Condux in Australia. Condux is a manufacturer from the USA and offers a comprehensive range of fibre optic cable installation equipment and tools. As an alternative winching fibre optic cable, the cable can be installed in ducts by blowing and fed through a small caterpillar system. This method can be used to install very long lengths of cable through small ducts. In addition, Condux manufacture a range of truck mounted fibre winches which can be supplied with a range of wheel diameters to suit cable requirements. All equipment will accept data loggers.